In February 2016, in the best traditions of suburban amateur theatre, a group of Sydneysiders of Sri Lankan background performed a play called The Lost Culavamsa (pronounced choo-la-vam-sa) written and directed by fellow thespian and playwright Ernest Macintyre at the Lighthouse Theatre in the grounds of Macquarie University. I had the privilege of co-directing this play as Ernest Macintyre himself was in poor health at the time. I have known the playwright for over 40 years and I was happy to oblige. It was a delightful rewriting of Oscar Wilde’s witty comedy of manners, The Importance of Being Earnest, about late Victorian English snobbery transplanted to an equally snobbish colonial setting in British Ceylon (Sri Lanka) in the 1930s. Ernest Macintyre had created an enjoyable piece of comic theatre about mistaken identity while engaging the audience with deeper questions of ‘race’ and ‘ethnicity’. Macintyre has re-imagined and re-worked Wilde’s play into a satire about the absurdity of racism and communal division. A play for our times and the universality of its theme won’t be lost on audiences who have never heard of Ceylon or Sri Lanka. However Macintyre is showing a mirror to Sri Lankans in particular. Many of the intricacies and details of the dialogue of The Lost Culavamsa will resonate especially to Sri Lankan audiences just emerging from a 30 year civil war that concluded in 2009. It was nothing short of a national trauma for that island and its inhabitants. At the core of the war was what it is to be a Sri Lankan. The island’s 2500 year written history was deployed by nationalists to justify and push political agendas. The Culavamsa is an ancient Sinhalese chronicle somewhat like the Anglo Saxon Chronicle or Beowulf written in the about the same time in the 7th or 8th century AD, which was the later version of a more ancient Sinhalese chronicle called the Mahavamsa that chronicled the ancient history of the island from the 5th century BC. These were written in poetic form like Homer’s Iliad and Odyssey, part history part mythology, and were “weaponised” by nationalists where ancient battles were used as dramatic props in a very 20th and 21st century civil war. Viewed in this context The Lost Culavamsa can be seen as much needed comic relief for a war weary country with a core message of tolerance. Macintyre has deployed the best comic traditions of English theatre to communicate this message to audiences in general and to Sri Lankan audiences in particular. Ironically Macintyre uses the English language in this context not as a symbol of colonial oppression, which it was at one point in Sri Lanka’s history, but as a language of unity and of liberation from the tyranny of ethnic hatred and division. Macintyre shows that English can be a used as a link language between the communities in Sri Lanka, uniting them so they can share their stories. In other words English can be appropriated as a Sri Lankan language. So Macintyre sets his play in the late afternoon of the British Empire as a means to communicate to Sri Lankans how they once were and not to feel ashamed or nostalgic but to learn and accept that colonialism changed the country forever and in Lady Panabokka’s words (the character based on Lady Bracknell) “that humans go forward, not backwards and whether the British Empire lasts or not, it is a stage in the forward motion of civilization”. These lines uttered by Lady Panabokka underline Macintyre’s view that history cannot be undone. Whether Sri Lankans like it or not colonialism was a historical reality and now forms an integral part of its history. Any attempt to wipe it out is not only futile but dangerous. It is a progressive view of independent Ceylon that drew upon the playwright’s own extensive experience in Sri Lankan theatre and the arts in the 1950s and 1960s. This was a period in the island’s history where artists, writers, dramatists, musicians, historians and architects of the English speaking elite (of which Macintyre and my parents were a part) were engaging with local Sinhalese and Tamil speaking artists in an attempt to construct a national “Sri Lankan” identity and vernacular culture that drew upon the best of European, Indian, other Asian and local Sri Lankan traditions. The milieu, in which Macintyre acted, directed and wrote in his youth and early adulthood still has a profound influence on his world view that a nation state consists of multiple nationalities, faiths and communities and should have a national artistic culture that draws upon its local multiple traditions while being nourished by international artistic influences including that of the country’s former colonial rulers. The fact that one can place Macintyre in the English / Australian theatrical tradition as well as in the Sri Lankan one is something that he is very comfortable with. An example of this is the first play he wrote in Australia in the 1970s called Let’s Give Them Curry a comedy about an immigrant Sri Lankan family in suburban Australia. Both Australia and Sri Lanka view that play as a part of their own theatrical repertoires. Unfortunately Let’s Give Them Curry was his first and only play that dealt with Australia. For in 1983 his world was turned upside down. The community he belonged to in Sri Lanka; the Tamils suffered a series of state sponsored pogroms where they and their property were systematically attacked by chauvinistic Sinhalese Buddhist mobs. Thousands were killed and the trajectory of the country changed forever. This affected Ernest Macintyre personally as he saw many close friends and family lose their lives and livelihoods. He used his vantage point in Australia to comment on the idiocy and futility of the endless cycle of violence in the land of his birth with a series of plays he wrote starting in 1984 and continuing to the present day. Macintyre drew upon his favourites of the Western theatrical canon – Sophocles, Shakespeare, Brecht, Beckett, Arthur Miller, Edward Albee, Shaw and Oscar Wilde to write satires, tragedies and comedies dealing with the subject of communal violence in Sri Lanka in order to have a wider conversation about identity. The Lost Culavamsa is the latest in that series. Lady Panabokka: A formal proposal of marriage shall be conducted properly in the presence of the parents of both parties, Sir Desmond and I and your two parents. However, that is not on the cards, at all, till my preliminary investigations are satisfactorily completed. Ernest, please be seated. Let me begin. James: I prefer to stand. Lady Panabokka: Some questions I have had prepared for some time. In fact this set of questions has evolved, at our social level, as a standard format of precaution, for our daughters and our social level. First, are you in any way involved in this so called peaceful movement for eventual independence from the British? Lady Panabokka: What is there to think about it? James: That we have to lead….. double lives…..
Lady Panabokka: What is that? James: Ernest is from the British Empire, Keethaponcalan from the native Tamil culture, something like a …a double life…..
Lady Panabokka: Where do you get such confused ideas from? James: From a scholar I know well……I was told that sometime or other the British Empire will be no more and we will all have to think of our own historical origins…. Lady Panabokka: How far back do we have to go? To when we were apes? Before we were Sinhalese or Tamil we were all apes, hanging on the same tree and chattering the same sounds! Tell your scholar, obsessed with the past, that humans go forward, not backwards and whether the British Empire lasts or not, it is a stage in the forward motion of civilization…. James: Never thought of it like that…. Lady Panabokka: So many things you “never thought of it like that”. And there is the practical problem of the Indians. My husband Sir Desmond thinks our only real protection from the Indians is to be in the firm embrace of the British Empire. And the Indian idea that we are of the same stock was put to the test when Sir Desmond had to visit India recently for a Bridge tournament and found that the supposedly bridging language between them and us, English, was subjected to such outlandish accents, that the game took sudden wayward turns, the way the Indian accents misled the Ceylonese. James: Yes, I have heard that they don’t speak English like us. Lady Panabokka: Now, what may be, a related question. Do you speak Sinhalese? James: Sin Halese……well, sort of, yes, to deal with the general population and…..
Lady Panabokka: That’s why I asked, because (with a sigh) the general population will always be with us. There is no harm, though, in knowing some Sin Halese oneself, for its own sake, but one must not carry it too far. Lady Panabokka: Yes, I don’t think you have heard of this man called Sara Chch Andra, a strange name even for a Sin Halese…. James: No, I have not heard…. Lady Panabokka: You know, Oscar Wilde’s “The Importance of Being Earnest”? James: I love it, I played Lady Bracknell in school! Lady Panabokka: It is one of our beloved plays, and this man, Sara Chch Andra has debased it by re- writing it, in Sin Halese, as “Hangi Hora” [Hidden Thief], whatever that means! Lady Panabokka: Yes, I got it from Professor Lyn Ludowyk. Lyn was at Sir Herbert Stanley’s garden party at Queens House yesterday, and he actually spoke about it approvingly. Sometimes I really can’t understand Lyn….why can’t these people write their own plays and not rewrite ours! Lady Panabokka who “supervises” this whole improbable comedy is the most identifiable of Oscar Wilde’s characters, the famous Lady Bracknell. She is transplanted. 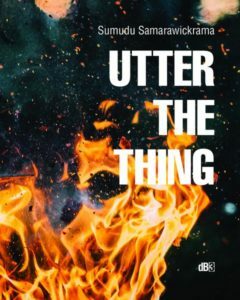 The whole plot, except for the meaning of ethnicity in Lanka which makes it a different play, is transplanted Oscar Wilde, with the colours, hues and texture of the plant growing naturally from the soil of British Ceylon. In the final Third Act of The Importance of Being Earnest the relatively minor character of Miss Prism exposes the real identities of Algernon Moncrieff and Jack Worthing to their respective love interests Cecily Cardew and Gwendolyn Fairfax. In Wilde’s play Miss Prism locates the lost handbag in which she left the baby Jack Worthing twenty years earlier. In The Lost Culavamsa the point of departure from Wilde lies in how Pamela Mendivitharna unveils the identities of Danton Walgampaya and James Keethaponcalan to their respective love interests Sridevi Kadirgamanathan and Gwendolyn Panabokka. While this baby [James] born into a Sinhalese family grows up as a Tamil, Pamela Mendivitharna … begins to doubt the well-held belief of the time [1930s] … that the ethnicities of Ceylon [Sri Lanka] resulted from North Indian Aryans settling in the island and South Indian Dravidians coming to the island as a different “race”. The final denouement of the play ends just as Wilde’s. The only difference being Pamela’s explanation to the audience that the two blood brothers were brought up in different environments and each displaying the characteristics of the environment in which they were brought up. Her study of the Culavamsa was crucial in her realisation that “our ethnicities reveal social attributes, not biological differences.” This is where Macintyre uses Wilde’s structure to expose the fallacy of ‘race’ as an exclusively biological characteristic. The ancient chroniclers and poets of the Culavamsa mention different groups or tribes or nationalities but they could not have had any idea of the very modern and European scientific and biological concept of ‘race’. Macintyre’s play is set in the 1930s, a time when Eugenics and the pseudo-science of Social Darwinism were prevalent in Europe and United States in order to legitimise the odious narrative of white European supremacy. This sort of thinking also influenced some South Asian nationalists during that time as they appropriated these European pseudo-sciences to construct their equally odious narratives of their own national origins. Later on this would have deadly consequences in the rise of fascism and communal violence in Europe and Asia. Macintyre, however, never loses focus that this play is essentially a romantic comedy. 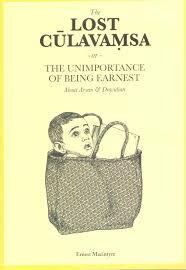 His close following of Wilde’s structure and characters in The Importance of Being Earnest makes viewing and reading Ernest Macintyre’s The Lost Culavamsa an enjoyable experience. Macintyre has transplanted all of Wilde’s minor characters including Reverend Chasuble who is re-created as Reverend Abraham Pachamuttu, the servant Lane as Seyadu Suleiman and the butler Merriman as Albert. As with all great comedies whether it be the films of Charlie Chaplin or Luis Bunuel or the plays of Oscar Wilde or George Bernard Shaw there is always an undercurrent of seriousness and even tragedy. The Lost Culavamsa is, in my mind, no different. ADAM RAFFEL is a Sydney poet and writer.